The board of the Green Climate Fund ( GCF) approved 13 new partners , last week, during a two day meeting in Songdo, South Korea. These 13 institutions are partly governments, international organizations, and there are also private banks such as Credit Agricole and HSBC. Prior to the Board’s twelfth meeting, 170 civil societies raised objection to the approval of these banks. Civil societies criticised these banks for being involved in mismanagement scandals, and for investing largely in fossil fuels. For the GCF, the partnership with the banks and others institutions means that they will demonstrate that they are committed to greening their portfolios. 33 entities are now authorized to partner with GCF and implement its projects and programmes. With $10.3 billion, GCF’s current pipeline includes 22 private and public projects with a total value of over USD 5 billion. In the meeting in South Corea, the board adopted a first strategic plan, which sets out GCF’s vision, operational priorities, and an action plan to be implemented by 2018. This strategic plan aims to scale the fund resources in an ambitious and country driver manner. “We have adopted the strategies and policies we urgently needed to evaluate existing funding proposals,” says, in a GCF press release, Zaheer Fakir, Co-Chair from South Africa. During the board meeting in South Corea, procedural decisions were taken to boost the Secretariat’s staffing from its current 56 permanent staff to 100 by the end of 2016, and 140 by the end of 2017. The Board approved also an USD 1.5 million for Rwanda as the first grant under the Fund’s Project Preparation Facility (PPF), an innovative instrument to support developing countries to generate high-quality projects, according to the GCF press release . It has also been announced that 13 countries under the Fund’s readiness and preparatory support programme will receive USD 11.2 million, following a grant agreement formerly signed with these countries. During the meeting, the United States informed the Board that it completed arrangements to transfer USD 500 million to the GCF as its first installment on its 3 billion pledge. In February, Mrs Cheikhrouhou, had informed, in a press release, that she would not seek a renewal of her three-year term, which ends in September this year. Last year in December, during the COP 21 in Paris, all the 195 countries agreed to help developing countries prepare for future climate impacts. They have adopted an ambitious agreement in Paris to limit the global warming below 2°C. The $10.3 billion fund has to invest in adaptation projects and in mitigation (wind, solar, geothermal and other clean energy sources). 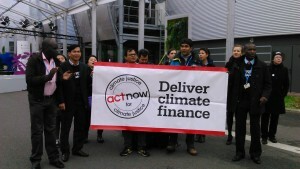 However, observers, civil societies and governments demand more financial support for fighting climate change. At the closing session of the COP 21, speaking on behalf G77+China, the environment minister of South Africa, Edna Molewa, raises concerns and pledges for futher discussions on increasing climate finance. “Given the exceptional nature of the Paris Climate Change Conference and our focus on securing an ambitious and fair Paris Agreement, a number of key issues related to the COP finance agenda unfortunately could not receive the appropriate consideration, particularly issues related to long-term finance and the guidance to the Standing Committee on Finance. We expect to come back in Morocco with substantive discussions on increasing finance ambition pre-2020,” she said. In 22 April, there will be a formal signing ceremony of the Paris Agreement at the United Nations in New York. The agreement will enter into force when at least 55 countries representing at least 55% of global emissions have ratified it. The next meeting of the Board will be held from 28 to 30 June 2016 at GCF Headquarters in Songdo.